Description: This cute video gamer is way to busy shooting, racing, and RPGing to worry about fashion. 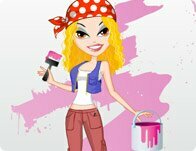 Score some style points for her and execute a makeover upgrade with some killer accessory and outfit combos! Instructions: Use your mouse to click on and through the floating clothing, hair, accessory, video game, and background options for this gaming girl! Wouldn't it be great to have a group of fairy godmothers watching over you? Well, this cute teen has the benefit of having some young fairies available to help her put together a magically perfect outfit! Create your best interpretation of the Ed hardy brand. Choose between graphic tees, caps, hoodies and pants to make a tattoo inspired look.